You knew it from day one! The first time you laid eyes on your baby boy, you knew life was never going to be the same. Because you knew that you had a Knight of Ren on your hands. Your family's always been force sensitive, sure, but for whatever reason, you just didn't have what it took to get recruited by the First Order. We don't think that's going to be a problem anymore! Now, he's a little older, a little angstier, and a little more in tune with the power of the dark side. Cool! 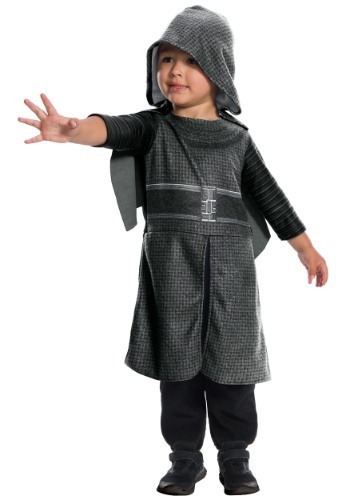 The only thing to do now to get him this Kylo Ren costume for toddlers. Then he'll be able to grow up the Star Wars way. It won't be the Jedi life for him, nope, it will be his life calling to seek out Supreme Leader Snoke and join the First Order and Knights of Ren to work to put the galaxy under the rule of a new Galactic Empire! Of course, this Kylo Ren costume doesn't come with a mask, because he's not going to want that until he gets to his teens. (We'll worry about that much, much later!). But it does come with the signature (and officially licensed) style of the tempestuous Kylo. As a robe and hooded cape, it has the dark style of the First Order warrior, and you could even arm him with a Kylo Ren lightsaber if you'd like to see just what he can do when he has his first Kylo style temper tantrum.